I have an absolutely stunning polish to show you guys today. 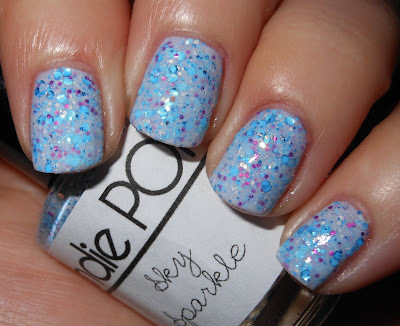 This is one of those polishes that makes you do a double take it is that gorgeous. This polish is made my Sindie Pop! Lacquer. I've been a fan of Sindie Pop! since her fall collection. Sindie Pop! makes some very impressive polishes. I can't get enough! 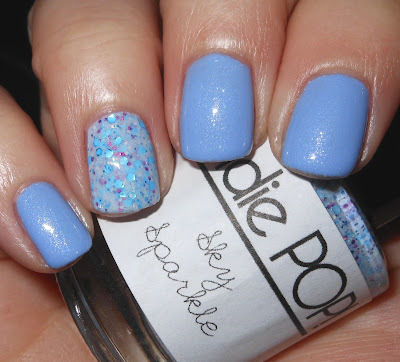 Sky Sparkle is a sheer white base mixed with blue, purple, silver, and micro holo glitters. This is jammed packed with glitter. I used 3 coats on its own. The best thing about this polish is it was a dream to work with. I've found glitters of this style in indie brands and mainstream brands really tricky to work with. This was absolutely not the case with Sky Sparkle. This applied smoothly, and I did not feel I had to put in any extra effort to apply this. This is truly stunning. I honestly think the picture can speak for itself. I really don't have anything more I can add. Just look at it!! Here is recent mani I did using Sinful Colors Morning Star and Sindie Pop! Sky Sparkle as an accent. You need this. I'm calling it a must have! I think I may get myself a second bottle. I purchased this polish on Sindie Pop! Lacquer's website for $8.00. I absolutely love this as an accent to Morning Star! Makes me long for spring! It's just so cold in NYC, I need more pastels like this to remind me that warmer weather should be coming soon. Aww, this is so gorgeous!! That is such a cute polish! I really, really like it. Holy moly, this is such a dreamy polish!! I love it!